To have a check on your computing system, the most common name that pops up is Norton. Other than contributing in antivirus software and computer security systems, Norton has now launched a program to help keep families safe from the probable online threats like cyber-bullying, indecent content, and pedophiles. Easy to install, this program is a pack of tools that has gone beyond Facebook parental controls, giving an extra protective measure in protecting our family online. Now it has become necessary to keep a close watch on the computer if your children are frequently using it. Though today it is the best tool for your kid to enter the world of knowledge, it can pose equal threats if the online interaction is not properly monitored. That is not really infringing upon your kids independence and freedom, but just creating an alert against the dangers that can wreck a havoc in their lives. Those who are using the free edition of Norton Family can view the usage of the past week, but those who are looking for more have to go for the Premier edition that contains the record of data usage for 90 days. Hence, parents are able to get a graph of usage for a week and also a monthly calendar that enlists the hours spent on which site each day. Norton Online Family sends e-mail alerts to the parents through one or more addresses whenever a child is violating the policies. The parents can be online as per their requirement to get a glimpse of their child's latest activity or even the past ones through a very detailed report. The Premier edition has a combination of all these features like sending out a summary of activity through email at the end of each week and at the end of every month. The Norton Online Family service in the basic pack is FREE forever. But the Norton Online Family Premier product has features that really don't hurt to pay for. Starting from tracking logging into Facebook, MySpace and other social networking sites, it has the feature of alerting parents if the child is visiting an adult page. It also creates an alert if the child is posting any personal information of his parents. The rest of the features are shared with the free edition and taken together, they make an impressively full-featured parental control system. One point worth noting is that Symantec emphasizes communication rather than rigid control. Parents can choose to warn a child rather than actively blocking access to inappropriate websites. The system can simply tell the child to log off when the time-limit kicks in rather than forcing the issue. And each child can view a simple, English-language version of the product's configuration settings expressed as "House Rules." 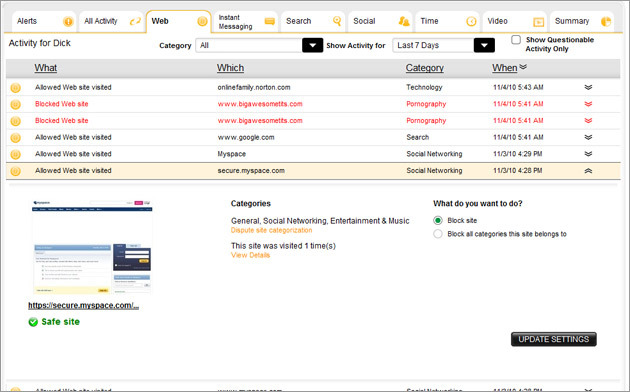 Norton gives you an aggregated list of all the sites visited within the stipulated time. Parents can click on each of them to get the detailed information about the site. In a separate page there will be a list of the recently searched terms apart from the Safe Search option that Norton insists on for the several popular sites like Google, Bing etc. Norton Online Family knows the necessity of setting up restrictions on the personal information that can be shared on the net by your child. Cyber Predators and scammers often make kids to reveal personal information in the garb of some important reason or just by alluring them for something. Norton comes in help whenever your child is about to enter those designated personal data into any social media site, by immediately sending an email alert to you. The program has a special feature called "house rules" where you can set the limits and restrictions within the program itself, so that these house rules are strictly followed by an agreement between the parent and the children which is already agreed upon through a pre-discussion and mutual understanding. Norton Online Family Premier will display these house rules on the computer or the device to create a reminder for the kids on the extent of freedom they have agreed upon. The most important feature of the Premier package is that it allows you to monitor the videos which your children are watching. Today, the most trending habit picked up by the young generation is watching videos. It can pose one of the most damaging threats, as it is hard to monitor what content they display. Norton Family Premier relieves you of this worry, as it can filter out the videos which contains adult content and also let you know if they are accessed by your kids violating the "house rules". Parental control is there for multiple PCs or Macs. You enjoy a complete remote configuration and extensive reporting. It has got a good Control and monitoring system on instant messaging. The New 90-day computer usage tracking is really a time saver. The New video monitoring feature makes it all more powerful. The E-mail alerts on violations of House Rules is really assuring. It also gives a scope to build up a good rapport with your child. There is no option for filtering HTTPS traffic. The Notification e-mails cannot create a link directly to the corresponding event in the report log. The other caveat is, though Norton Online Family creates individual accounts for each child and also allows you can add another child at any point of time, unfortunately, it works only for one active profile per device. So, if you have a single computer with multiple users, all the tracked searches and activities would be dumped into one single report. This can get few things wrong as sometimes you might fail to distinguish all those activities that has been done by the child alone. The free package of Norton Online Family gives you almost everything one could want for creating a parental control system used in a multi-computer household. But going ahead for the paid Premier edition will add up the benefit of getting a long-term information on the computer usage, through regular e-mail summaries, and will also monitor the videos watched which is undoubtedly a very important feature. 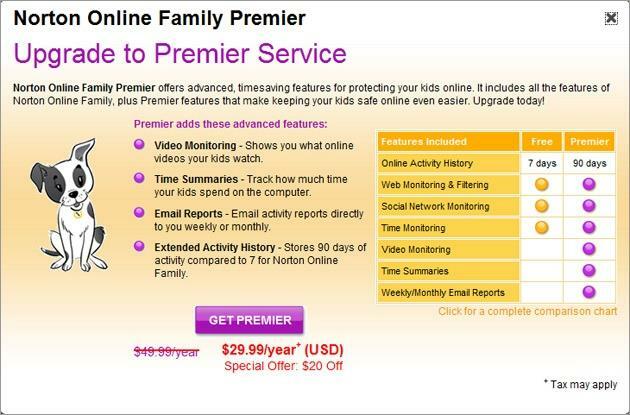 The Norton Online Family Premier is going $49.99/year with the initial promotional price reducing $20 off for the first year. That has been a great piece of technology. It is a big boon for working parents. Being able to keep track of the activities by the children will help them have a good parental control on what the children are doing or watching.